We could all use more light right now, literally, and figuratively. January has been especially grey and rainy here, and we haven't seen sunshine for over two weeks. And then of course, there are the daily updates from Washington that threaten to bury us in a dark sludge of hate, lies and ignorance. This post is as light-hearted and non-political as I could muster - a documentation of what I wore to work on a regular week (albeit a short one, as I took Friday off) with colourful backgrounds, fun clothing, and a sense of humour. 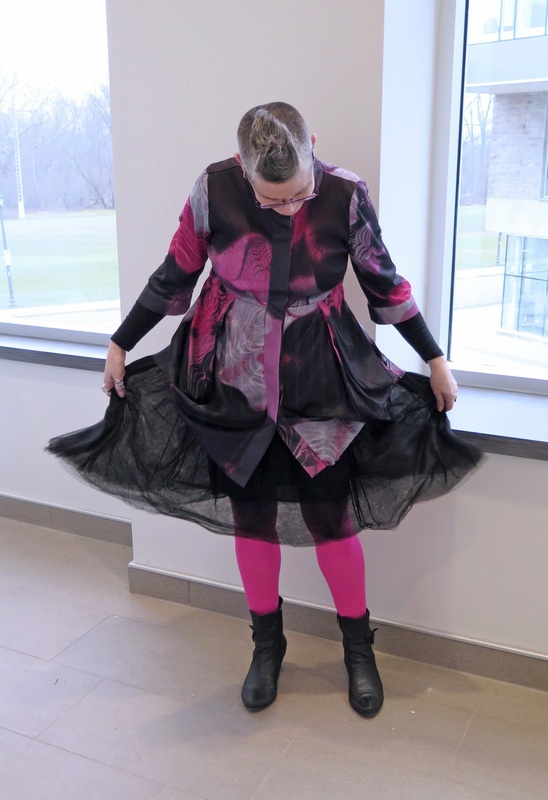 I started the week with one of my favourite colour combinations of pink and black. The blouse is from Blue Pepper Vintage, and I found the floofy (and rather see-through) tulle skirt at a Goodwill Thrift Store last weekend. I had a photo of me looking at the camera, but I rather liked how my hair looks from this angle. 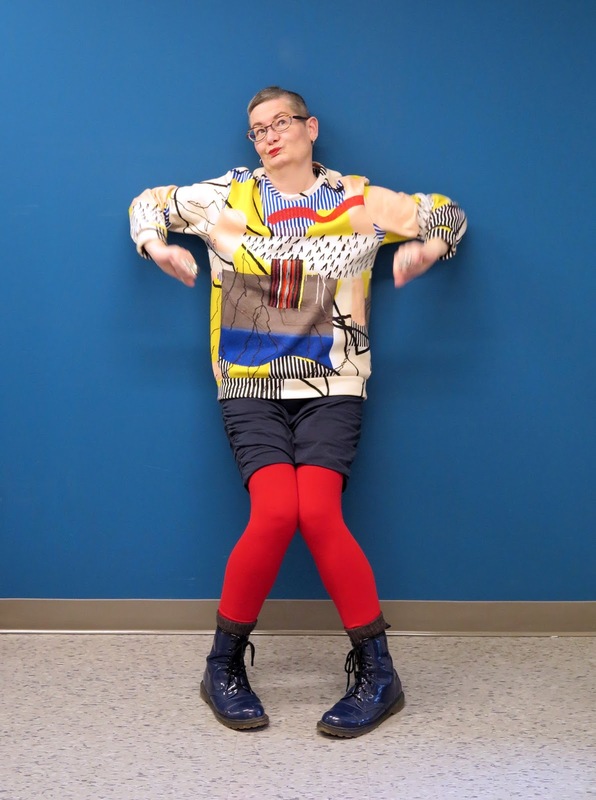 I really liked this outfit - the colours make me feel good, and it was very warm and cozy. The sweatshirt is one of the few great pieces of clothing I've found at Winners, the skirt came from a consignment store, and the fleece-lined leggings are from Talize. 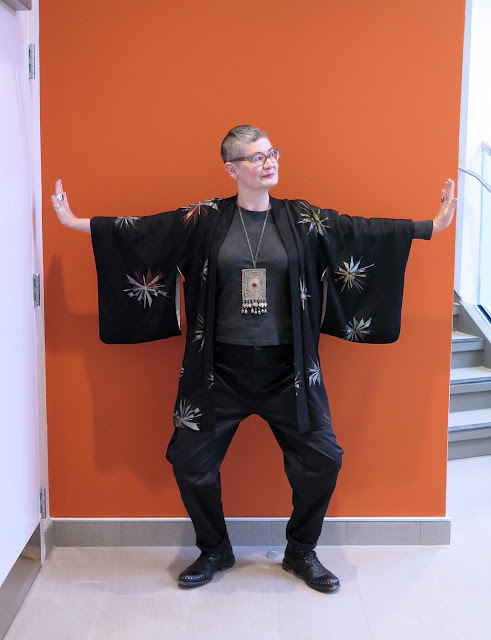 I always feel more comfortable goofing around with poses when my friend Heather takes my photo (she took this one, and Thursday's). When I have to ask a co-worker to take my photo I try not to take up much of their time, which means no horsing around. Wednesday's outfit combined some of my favourite pieces into an odd, but satisfying mishmash of patterns. The dress was found at Talize some time ago, and could be worn with black tights, heels, and a black jacket in a more conservative work environment. However, since I can pretty much wear what I want to work, I layered it over Hello Kitty leggings and a long-sleeved t-shirt. The ruffled neck piece is from Raggedy Rags, and it seems to look good over almost anything. Looking at the photo, I think the boots look too big and clunky with the outfit, but some experiments are more successful than others. For the last outfit of my work week, some strangely shaped pants from From Mars were combined with a vintage Haori from the Manhattan Vintage Show. The necklace is made from a piece of vintage belly dancer's belt (the belt was vintage, not the Belly Dancer) and came from The Sentimentalist. dear lady, I love your outfits, they're cheering up my day! 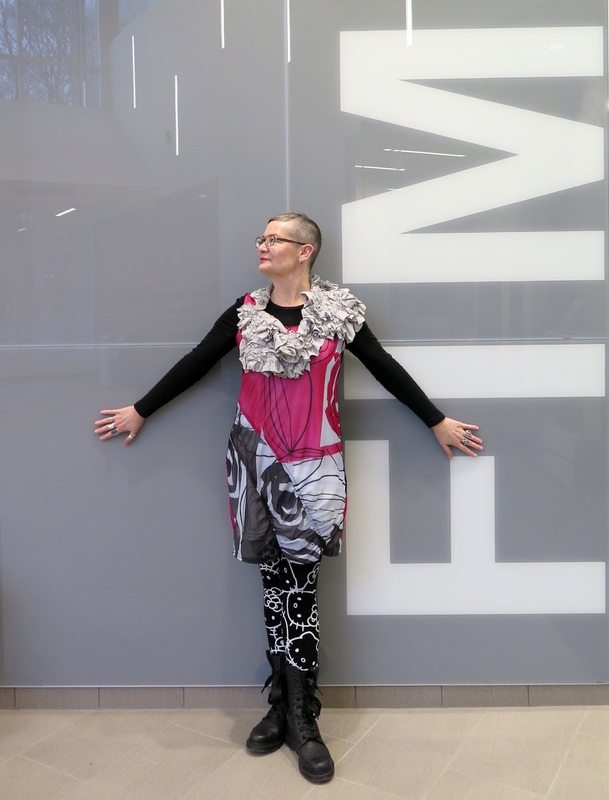 love all those graphic prints, the pink and black color combo, the unusual shapes, the leggings, the chunky boots and the fabulous bijouterie and cool details. I really love everything about your style, and I'm grateful you share it! Gorgeous! Wonderful all--- but my favourites are Wednesday and Thursday- what an inspiration you are! Great outfits! You have such a fun sense of style. I love seeing what you put together. I love to see you having fun with photos - I know it's not easy when there are many limitations involved. This new building has some awesome backgrounds, eh?, and they work fantastically well with your wardrobe. Great outfits all. Your style really shouts when you have a rundown like this. Love it! It must be fun to be your co-worker! I'm sure they can't wait to see what you come up with next, which is true for me. What a review. Love the combinations, poses and the fabulous fun that you clearly display. Thanks for a reprieve from the political scene, which has become very frightening and disturbing. The students seem to enjoy my outfits more than my co-workers, who for the most part dress pretty conservatively. Thank you so much Elizabeth - I appreciate your kind words! Gosh, I love all of these looks! I enjoy your poses and how you just put yourself out there. That whacky sweater is fabulous. I love that sweatshirt, and it's so warm and cozy. The only downside is the inside is white fleece and it leaves white fluff all over everything. nice outfits. Sorry about Washington. Tuesday, Tuesday, la-la-la, oh, I love Tuesday! It sounds as though you are getting Vancouver weather while we get snowed on. Huh. We don't do snow well here, but I will say that it brightens the landscape enormously. What a stunner of a line-up and stupendously well posed, too. I'm drooling over outfit number three especially the pendant. I am with you all the way. We need women who don't take themselves too seriously, who love goofing around and who dare to be different. Probably why I like you 🙃😉.